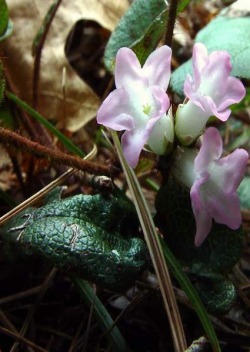 Other common names: Trailing arbutus, Mayflower, shad-flower, ground laurel, mountain pink, winter pink. Habitat and range: This shrubby little plant spreads out on the ground in sandy soil, being found especially under evergreen trees from Florida to Michigan and northward. Description: The gravel plant is one of our early spring flowers, and under its more popular name "trailing arbutus" it is greatly prized on account of its delicate shell-pink, waxy blossoms with their faint yet spicy fragrance. Gravel plant is the name that is generally applied to it in the drug trade. It spreads on the ground with stems 6 inches or more in length and has rust-colored hairy twigs bearing evergreen leaves. The leaves are green above and below, thick and leathery, oval or roundish, sometimes with. the top pointed, blunt, or having a short stiff point and a rounded or heart-shaped base. The margins are unbroken and the upper surface is smooth, while the lower surface is somewhat hairy. The leaves measure from 1 to 3 inches in length and are about half as wide, the hairy stalks supporting them ranging from one-fourth of an inch to 2 inches in length. Early in the year, from about March to May, the flower clusters appear. These are borne in the axils of the leaves and at the ends of the branches and consist of several waxy, pinkish-white, fragrant flowers with saucer-shaped, 5-lobed corolla, the throat of the corolla tube being very densely hairy within. The seed capsule is somewhat roundish, flattened, five celled, and contains numerous seeds. The gravel plant, belongs to the heath family (Ericaceae) and is a perennial. Collection, prices, and uses: The leaves are collected at flowering time and are worth about 3 or 4 cents a pound. They have a bitter, astringent taste and are said to possess astringent and diuretic properties.